OCTOBER 18, 2011: Gurmukh Kaur Khalsa could have easily succumbed to a Hollywood lifestyle. The respected Los Angeles based Kundalini yogi has attracted celebrities such as Madonna, David Duchovny, Melissa Etheridge and Gwyneth Paltrow. She's been featured in the New York Times, Vogue, InStyle, Spin and Rolling Stone for her teachings. And her presence is continually demanded around the world, leading her to travel 240 days out of the year. The lively 69-year-old master rubs elbows with glamour on a daily basis, but that doesn't mean the starstudded appeal will ever uproot her from the earth. "I don't do it for fame. I don't do it for fortune. I don't do it just for celebrities. I don't care who's in the audience or who the people are. I do it for service and for health," Gurmukh says over the phone from Golden Bridge Yoga Centre in Los Angeles, where she acts as the studio's founder and director. "It doesn't matter who they are," Gurmukh continues. "Whenever you help people, whether you're a mother or a social worker or a doctor, it just makes you, personally, feel better. "That's the reward right there. Feeling better and feeling like I'm doing what I'm meant to do this lifetime." Gurmukh, who will be leading two workshops in Edmonton on Oct. 24 and 25, has taught Kundalini yoga to students of all shapes and sizes. The Kundalini practice is a gentle form of yoga that focuses on sound, breath and posture to increase spiritual awareness. Gurmukh's specialty is in pre-natal yoga, where she teaches expectant mothers exercises and meditation to develop strong relationships with their babies. 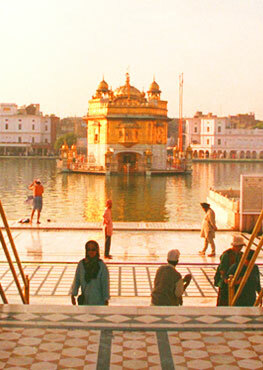 It was Yogi Bhajan, the Sikh leader who first brought the practice to North America, who gave Gurmukh her Sikh spiritual name, which means "one who takes thousands across the world ocean." The name has proven to be apt, considering Gurmukh has dedicated her life to helping people around the world find happiness through yoga. "I have seen, throughout these past years, 42 years, I've been teaching it, people's lives change for the better - whether it's their health, more sound of mind, if prosperity comes to them, relationships work for them, or if dreams come true," Gurmukh says. "I just find that, what we teach and what we have to offer to people and what we help people experience, which is themselves, they just are happier. Our whole motivation is to help people to become happy and healthy and whole." Although Gurmukh is already a Kundalini master, that doesn't mean her own training has stopped. She is up at 4 a.m. every day and practises her yoga, meditation and prayers until 6: 30 a.m.
She also travels the world extensively with her husband, teaching prospective Kundalini instructors and growing with each experience. Although Gurmukh is always on the go, the nomadic lifestyle doesn't bother her. Wherever she teaches she feels at home, and she's looking forward to adding Edmonton to that list. "(People can expect) a lot of humour. A lot of fun. A lot of sweating. A lot of energizing, creativity and helping each person to find what is their dreams, what is their longing, and if they are living it," Gurmukh says. "Some people stay in little boxes because they feel more safe or they don't know how to step out of it. They don't know how to live, really. Kundalini yoga helps you to live fully and happily." Yoga master Gurmukh Kaur Khalsa will present two workshops in Edmonton. Oct. 24, from 6 p.m. to 8: 30 p.m. at Laurier Heights School, 8210 142nd St.
Oct. 25, from 6 p.m. to 8: 30 p.m. at Ross Sheppard High School, 13546 111th Ave.
Workshops are open to the general public. No previous experience is necessary. Now we have the great opportunity to talk to Gurmukh Kaur Khalsa (link) about some of the most essential questions in life! She is one of the first students of Yogi Bhajan, Siri Singh Sahib Harbhajan Singh Khalsa Yogiji (link) and had the privilege to learn directly from him. Once she told us that sometimes she had a really hard and challenging time with her teacher Yogi Bhajan. She said every time she thought she had done well, he confronted, poked and provoked her so much that afterwards she felt horrible. But then she realized that the only reason he did that was to uplift her, to help her break old habits and mind patterns, and break through the ego perspective on life! This is actually what Kundalini Yoga teachers do with their students: “Poke, provoke, confront, elevate”, Yogi Bhajan says. If you really want to change and transform yourself you first need to be confronted and challenged. And that sometimes hurts because the ego and the mind are fishing for “compliments”, not for criticism. Interview with Gurmukh Kaur Khalsa from Journey To Infinity on Vimeo.